We recently sat down with Hotel School graduate George Merkouris, to chat about his time at the university and the success he’s had since graduating. George is the Head of Events, Sales and Marketing at Beta Bar & Gallery, Sydney. 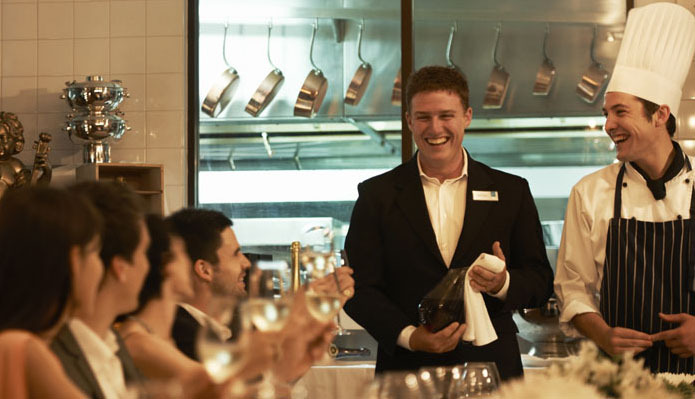 When did you graduate from The Hotel School? 16th September 2005, my graduation day. I started 2003, so at the end of 2004 I basically finished, and graduated 16th of September 2005. That was my graduation day. And did you go straight from school to The Hotel School? No I went in at 33, I was one of the old codgers. Oh fantastic, so a mature aged student. So what prompted the decision to go to The Hotel School. I was originally looking to further my education, to be honest, and I wanted to do some sort of business, but I didn’t want to do accounting or anything like that. I was in hospitality prior to that as well and I’ve always loved hotels and I thought, “wow, if I could only find an institution which has got something to do with hotels.” And I came across Southern Cross Uni and The Hotel School and it just ticked all my boxes. I went, “that’s it, it’s calling me, that’s my degree, I want to do a business degree in hotel management.” And so I opted to do that. I know it’s over 10 years ago now, but how did you find the degree and can you remember some highlights? I started looking through UAC and the general universities: what they had to offer and what courses. Then when I read up about The Hotel School – I actually saw it when I was working in the industry. I knew the Intercon Hotel of course, but then I saw they had attached a school, called The Hotel School, and that was part of the University of Southern Cross. And I thought, “wow that’s a good uni,” and then I went and looked through the degree and saw what it had and it ticked everything. I just went, you know, that could really help. It’s a business degree primarily, but it’s in that field that I like of hotel management. Then when I looked further into the criteria I thought: well it’s not just about hotels, it’s also about being an entrepreneur, it’s also about conventions, which I really enjoyed and I wanted to get heavier into. And truly because it offered two of my primary majors that I wanted, which was entrepreneurship and convention management, it solved my deal. So I went: perfect, that’s exactly what I want to do. What was your experience like doing the course? It was very intense, but I thought it a degree which was laid out and the coursework was great and the lecturers were fantastic. Another thing I really enjoyed about the school is that it was such a professional school. You had to wear a suit and tie, you had to be as a business person. I thought that exactly, not just for myself but also for other students, that is the perfect starting point where your whole mindset and your whole attitude changed as well with the university. I thought to be honest it was quite an elite university and I thought it had a very good brand. But also as an institution Southern Cross University being Australian as well and being so vast I didn’t have to go up to the north coast, I could go straight into the city because I lived in the city and it was also quite convenient. But I also really enjoyed the institution here in The Hotel School. Because it was attached to the Intercon I just thought it was such a beautiful property as well, apart from the curriculum that it’s got. I loved my time at that school to be honest. It’s only been after many years of graduating and everything, and seeing the success that that little, we’ll call it an investment, call it a sacrifice, that I did for the two years – how it all just came into fruition and all these doors opened up. So I thought, when I first looked at it, it could do me very good, and so that’s exactly why I did it. That’s fantastic. And can you tell me what you’ve been doing since you finished studying? When I finished I came out and… I was working at the Intercon in Sydney while studying, but unfortunately when I finished my studies, I was working casually, because I worked pretty much full time, so studied full time as well. So there wasn’t a lot of time to socialise. But after I finished with the Intercon, all these different doors started opening up, such as – I had an opportunity to work with a group called the Dockside Group, and we opened up a water view convention centre, which was one of my majors that I did, convention management. So that opened that door up in the standalone venues and we worked that quite well. And then I was very fortunate that I got into hotels and I went to the Four Seasons. I started working with Four Seasons for many years. Then I did another 5-star hotel called the Shangri La, which was the last hotel I worked at. I worked in my field that I wanted, of conventions and meetings and events, and that’s what I specialised in because they were my majors: convention management and entrepreneurship. I was able to hone into the hotel side of things with that. But then that brought me into my sales and marketing sector and so all these different doors and opportunities started opening up for me. To this present day now I am the head of events, sales and marketing here at the Hellenic Club, Sydney and we’ve just opened up a brand new bar and events place called Beta Bar and Gallery on Castlereagh Street, 238. All these great opportunities that arose would never have come by if I didn’t go to The Hotel School. That’s fabulous. And I have to say I had a brief look online at the property you’re managing and it looks beautiful, it looks really nice. That’s so exciting. So the role you’re in now, do you feel like it’s a bit of a dream role for you? To be honest with you, yes. Look, we all work quite hard, and you strive when you’re working in a big conglomerate like a big hotel or a big chain, you know, eventually you can move up the ranks. But when this opportunity of being part of the opening and managing a brand new venue in Sydney, in my own home town and given the opportunity of the role – in essence a three handed role. I don’t look at it as a three handed role, I just look at it as just one big component. At the end of the day it’s just making that venue, because I believe in the venue. I think the venue is just one of the most beautiful venues in Sydney, and it’s something Sydney doesn’t have. It has lots of little spaces and lots of little bars, but when you see the character here and you see the service levels that we’re implementing and we’re doing, it’s comparable to any establishment like a big 5-star hotel or an elite property of some sort – where we can make our mark and bring that entity of being an art gallery to the general community for both business events and social events and weddings and the rest; any type of special event where one feels that it is just a unique space. And it really is, it’s done very nicely. And yes, I think it’s a big job because no sales and marketing really existed for it. And now, being able to put in place policies, procedures, marketing and working with different external organisations and key stakeholders expanded my mind even further than what an international hotel would be like. And you can always bring all your knowledge and all your experiences from….and I think I’ve been quite fortunate in regards to; yes, I’ve worked hard, but I’ve also been given great opportunities. This new opportunity with the Hellenic Club and Beta Bar and Gallery is a dream come true because I was able to now put into place everything that I had learned through Uni. But I could actually put it into place and be able to make it work. But also really key and important is: be an example to up and coming managers, hoteliers, anyone in that hospitality and hotel business, that it can work, it can really be done. It is a great industry. In general, tourism and hospitality is here to stay because people have got to eat and drink, so that’s where your restaurants and events come through. And everyone’s got to have some sort of meetings and dialogues to occur so that always happens. When you marry those two together, and you have a product or a venue or a space which is unique yet it is also coupled with service. Because through the hotel, through my experience and times with hotels and organisations and standalone organisations you value what it is all about. And the paradigm these days is no longer about food and beverage and that’s it, anyone can put together food and beverage. It’s that additional thing of service levels, that is the new paradigm. We are all here to ensure that our customers and our clients look good in front of their own clients, but we build a very good relationship with them. And the same thing here with Beta Bar and Gallery: primarily, yes, we are food and beverage and hospitality in the industry, but we also pride ourselves on exceptional service. It’s been great because I’ve worked with a good team who are also on that same trajectory where they do understand that we’ve got to stand out from others. And how do we stand out from others? Apart from having a bit of passion about what we do and believing in what we’re doing. Because of all that controversy out there in the world you know: hospitality doesn’t pay, all of that. As I’ve said to many students when I’ve done some guest speaking with the hotel school, in time everything falls into place. We do work odd hours, we do work when others are socialising, we are in the service industry, you know, that is what we are. If you’re not prepared to be in that service industry and appreciate it and love what it can give you, then in essence you’re in the wrong industry, get into banking. But the role is a big role, but the role is a very, very satisfying role. And when I see numbers increasing, when I see good reviews like we’ve had – truly, there hasn’t been much advertising about Beta Bar and Gallery – a lot of it has been through word of mouth, a lot of it has been through good work that our stakeholders such as the PR company we work with are doing their job. But generally when somebody walks into the venue, it’s the “wow!” Followed by the “wow” is the “wow what sensational service we got.” From point A, from initial contact, to the conclusion when they’re departing and we’re saying goodbye to them, it’s like their home. They stand out. It’s something they couldn’t even imagine what it would be like, but when it happens it’s magical. That’s so great. And just lastly, to wrap up, can I just ask you what advice would you have for current Year 12 students who might be considering studying at The Hotel School? Would you have anything to say to them about their choices? I would say just a couple of things. One is: it is an investment that you put into it. The teaching staff and the facilities are of global proportion, they are sensational. It is backed and you are trained with part of the Mulpha group, part of the Intercontinental Hotel Group and Southern Cross University. And that partnership with a hotel of international standards and an institution such as Southern Cross University is a perfect marriage, because you understand and you get all the relevant exposure, tuition, studies, experience, all into one plate out of that degree. If I could just turn and say something to the students is: it’s a journey that we take from the beginning to wherever. You don’t think that you’re going to just come out and you’re going to be a hotel manager or a general manager instantly, you’ve still got to work hard. But you’ve got to go for gold and you’ve got to dream high and you’ve got to work hard at it and you’ve got to be committed. And once you complete your degree, whether you complete your diploma or events diploma or your degree or even your masters or further education, you take pride, work hard, it’s only a blip in your whole life at the end of it. And if you work hard from the beginning and you do your very best when you finish, not only are you proud and you feel this sense of achievement, but all these doors open up for you – networking, through your studies, and the hospitality industry is a dream to work in. That’s so great, thank you so much. Great to hear you talking with such passion I really, really enjoyed it thank you. If I could do it all over again, I would do it all over again. It was fantastic and it was the best thing I ever did in my life. Even though I was a mature aged student you still had to work hard and especially my lecturers. Now they’ve become a bit of an extended family and I just really, truly say to anyone who talks to me about Southern Cross, and especially the Hotel School, it changed my life, it really did.